Crazy Pistol is a shooter game developed by ESERGAMES. 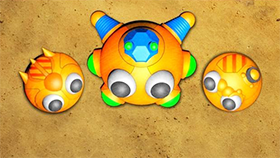 The game has cute graphics and simple gameplay, suitable for all those who like shooter. Because it is a flash game, you can play the game in your browser. In the game, you control a gun and your mission is to shoot targets in the map. Each time you hit the target, you get points. If you miss, you will get 1 error. When you get 20 errors, you will lose. Duck: Move very fast at the bottom of the screen. Shoot it will be 550 points. Ball: Moves very fast in the middle of the screen. Shoot it to get 750 points. Target Archery: Appears for a few seconds and then disappears. Shoot it to get 250 points. Picture: moving slowly. Shoot it to get 500 points. There are also robots. You need to shoot multiple times to destroy them. You will also have 3 trophies in this game. Each trophy will be a required score that you need to achieve. Shoot the ammo boxes on the right of the screen to reload.